On this date 31 years ago, CNEWA’s Mother of Mercy Clinic opened in the Jordanian city of Zerqa. Mother of Mercy is the creation of not one person, community or organization, but of a partnership. In 1981, Zerqa’s Latin Catholic community asked the Franciscan Missionaries of the Divine Motherhood and CNEWA’s operating agency in the Middle East, the Pontifical Mission for Palestine, to consider opening a mother and child clinic on the grounds of the Latin parish. A congregation of nursing sisters based in England, the Franciscan Missionaries, had collaborated with the Pontifical Mission in operating mobile health clinics in Jordan’s refugee camps since 1971. Their principle concern at that time was the reduction of the mortality rate — then 40 percent — among babies born to Palestinian refugee mothers. Poor nutrition and the lack of education and health awareness contributed to many of these deaths, as well as to deaths of the elderly. After a period of review, CNEWA and the Franciscan Missionaries, with the support of the Latin Patriarchate, agreed to open the clinic, receiving monies to build, furnish and operate the center from Canadian members of the Equestrian Order of the Holy Sepulchre of Jerusalem. After just a few years, the number of patients receiving care at the clinic increased by 214 percent, requiring an extensive refurbishment. In 1985, the German bishops’ relief and development fund, Misereor, provided the necessary funds. Today, the Dominican Sisters of St. Catherine of Siena, an Iraqi community based in Mosul, administer the clinic, which treats more than 33,000 mothers and children a year. On a cold and wet November day, a group of carpenters hammered away at the roof of St. Michael the Archangel Greek Catholic Church in the village of Ladomirová in northeastern Slovakia. Built in 1742, St. Michael’s stands out as perhaps Slovakia’s most beautiful and celebrated historic wooden church. Surveying the men’s work, the church’s pastor, Father Peter Jakub, explained that after 40 years, it was time to replace the worn hand-cut spruce shingles. Only some 50 wooden churches, most dating back two centuries, survive in the modern central European republic of Slovakia; historians estimate more than 300 may have been built between the 16th and 18th centuries. Approximately 30 belong to the Slovak Greek Catholic Church. A handful have been closed and restored as museums, while the remaining churches are used by Evangelical Protestant or Latin (Roman) Catholic congregations. In recent decades, the Slovak government has designated 27 of these tserkvi (Slavonic for wooden churches) as national cultural monuments. These wooden structures are inexorably fragile, vulnerable to decay and fire. But as architectural achievements constructed during a tumultuous and religiously volatile era, they now galvanize significant interest in and support for their restoration and preservation. The lion’s share of Slovakia’s wooden churches clusters in the eastern region of Prešov, a mountainous and heavily forested area bordering Poland and Ukraine. Rusyn Greek Catholics — who inhabited tiny hamlets scattered throughout the Carpathian Mountains — constructed most of these churches. For more on Slovakia’s Greek Catholic heritage, and the country’s remarkable churches, read Rooted in Wood from the May 2008 issue of ONE. Read more about this community in the July 2002 issue of our magazine. Lebanon, with its relatively large number of Christians — more than 30 percent of the population — is a natural choice for Christian Syrians seeking refuge. Beyond religion, most of the Syrian Christian refugees have chosen Lebanon for more pragmatic reasons. Many have family living in Lebanon, either as citizens or as laborers who have migrated to work in construction or farming since the Lebanese civil war ended in 1990. Others come to Lebanon, as in Mrs. Qarnous’s case, because it is the closest border to cross to safety. The trip is difficult and dangerous. Civilians have to navigate a complex landscape of warring factions, shelling and random attacks in order to arrive safely. Even after that, hunger, poverty and exposure to the elements await many of them in Lebanon. 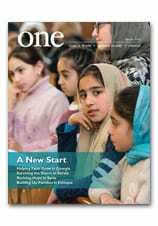 Read more about Syrians Crossing the Border in the Spring 2013 issue of ONE.